‘Story-telling’ is often quoted as a way of communicating scientific ideas to non-scientific audiences. It’s seen as a way of providing a form of narrative with which an audience can relate to, and thus provide a more engaging account of a scientific report. Admittedly, not everything can be transformed into a story of sorts, but there are many aspects of science, be it theoretical, model-based, or empirical that can benefit from communication via this format. With regards to this format of communication, it seems (in my little experience) that there are a suite of phrases that are often used somewhat interchangeably, but which have different meanings and different purposes. Plot – Storyline, or plan of a scientific report. Theme – The pervading subject throughout a report. Story – An account of an event or series of events, or something that can be instructional in a broader sense. Narrative – The telling of the story, and the manner in which it is told. Context – The discourse that frames the report, within which it can be fully understood in relative terms. This is now the fifth part in a series exploring the public communication of geoscience, this time focusing on the role that television can play as a communication medium. It is based on, and a development of the ideas conveyed within a paper by Iain Stewart, no stranger to TV himself, and Ted Nield, a writer of popular geoscientific novels and Editor of Geoscientist magazine published by the Geological Society. 1. Why bother with communication? 2. What do the public already know about geoscience? 3. Who are this ‘public’ we are aiming to communicate with? 4. What is the role of the mass media and newspapers in communication? This is the fourth part of a series looking at how we should effectively communicate geoscience, based largely on a recent paper by Iain Stewart and Ted Nield. The previous post attempted to address the insanely impossible question of ‘who are the public?’, when it comes to public engagement’. It seems that this is very much a disciplinary issue, each with their own collective suite of hurdles and mountains to climb. The conclusion, I think, was that although identifying various ‘publics’ and sub-categories based on social traits, the use of this is only in identifying some sort of strategic framework for science communication to operate within, when what we really should be doing is ignoring that, and actually going out there and actually doing things. At the recent Festival of Geology in London, I saw kids (and adults!) having a blast playing with robotic trilobites. As a form of communication, I’d say doing practical things like that are infinitely more valuable than discussing which public group the trilobites are trying to commune with (as an example). 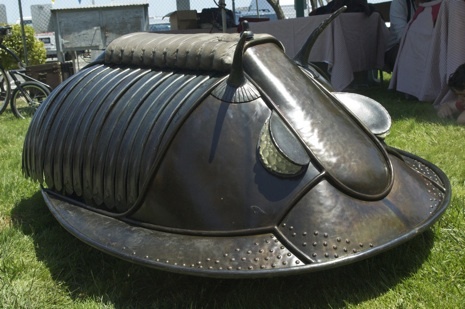 Almost as cool as this rideable trilobite! Who the devil are this ‘public’ everyone keeps rambling on about? The last two posts in this series, based on a recent paper by Ted Nield and Iain Stewart, addressed the issues of why should scientists bother communicating, and what do people in general already know about science, and geoscience in particular. Oddly, these are the most fundamental questions when it comes to science communication, but often can be the most difficult to answer. They either require a degree of personal subjectivity, or data that can be extremely difficult to obtain and measure in any meaningful way. Throughout any discussion of science communication, the ‘engagees’ are typically referred to as ‘the general public’, and on a more specific level, public stakeholders – those who require or will use in some way the information being conveyed to them. Scientists are probably best at communicating between other branches of scientist, be they in academia, industry, government, or elsewhere. I guess this is due to the inherent fact that there will more often be a commonality of both understanding and interest, within fields, that may not be as highly replicated outside of these spheres.